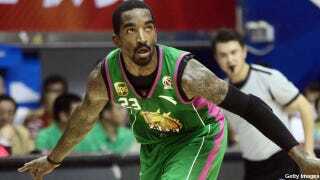 When last we left J.R. Smith in China, he was starting international incidents and breaking Stephon Marbury's ankles. Today Smith announced he's choosing the Knicks and their $2.5 million exception. Here are the things this means. This means that someone thinks Steve Novak can't sustain his 47 percent shooting from beyond the arc. This means at any given point, there will be at least three Knicks who want the ball in their hands. And this means a sad day for the now-unemployed Renaldo Balkman, who may never get a chance at redemption like twice-teammate Jared Jeffries. The Clippers also had their eye on Smith, and though they couldn't pay as much money as the Knicks, they thought they had a better team to offer. But the Knicks weren't going to let this one get away. Supposedly they had a rep waiting for Smith as he got off the plane from China yesterday evening, hoping to sign him as he went through customs. When that didn't work, and New York found out Smith was grabbing a connecting flight to Vegas, they sent their rep along too.